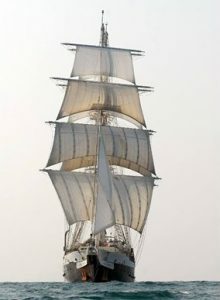 We’re saying Bon Voyage to our intrepid challenger Julia, who sailed off on her tall ships challenge on the high seas on 27 Feb, sailing from Las Palmas & back to Southampton, with just a wee detour via the Azores. This is not a challenge for the faint of heart! Julia is going armed with our CCTA GoPro…we’re looking forward to some birds eye footage from the top of the mast. As well as gearing herself up for what will be a pretty epic challenge, Julia is also raising funds for the wonderful Blythe House Hospice in the High Peak. Blythe House is a hospice close to our hearts – they provide incredible support to people & families affected by life changing illness. Julia’s own thanks to her friends & strong suport network at Blythe House, is a moving insight into the great work provided by everyone at this wonderful place.